The following extract refers to the 1890s. The 1881 census lists an *Esther Brogden at Henwood Cottages, a 39-year old widow with four of her seven children at home. The eldest at 14 was at work as a brickyard labourer. The three other children were aged 10, 7 and 2. Esther Brogden's occupation was "Tailoress" and she could be the "Mrs Brogden" referred to, except that she did not have a daughter named Lizzie. In 1891, however, the census shows Esther living with her brother Charles and his wife Elizabeth who had a daughter named Elizabeth. Further research from the 1891 census should give more information and perhaps clarify which Mrs Brogden is the subject of this extract. *This Esther's youngest son Stephen is the grandfather of David Brogden. David lives in Cumnor to this day and provided the extract. "Slop-work" derives from "slops" - originally, ready-made clothing and other furnishings supplied to seamen from the ship's stores. It became a term for ready-made, cheap or inferior garments generally, according to the Oxford English Dictionary. "Fifty years ago, what was called "slop-work" or "the trousering" was an industry in the village. 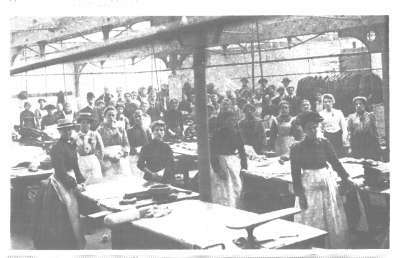 Wages were low and in order to earn a few shillings, women sewed corduroy trousers for an *Abingdon firm. All farm labourers wore cords because they were cheap and durable and kept out the weather. A pair of brown corduroys then cost four and sixpence; today they are the hallmark of the university man. The material was cut out, and the seams stitched, at the factory, but the finishings were done by hand. These were the linings, setting in of the pockets, facings of pockets, and buttons and buttonholes, and they were sewn by the village women who were in dire need of money with only 9 shillings and sixpence coming in a week, and a shilling off for "baccy" and a few coppers for club-money, for fear their man fell ill.
"Every Friday, Mrs Trinder, the carrier, brought bundles of unfinished trousers from the factory and gave them out to the various cottage-women. I often drove with her and I can still remember the pungent smell of the corduroy which the children much disliked in their homes. The following Friday, the carrier would call for the finished trousers, and in the evening bring back more bundles. "I have heard that Mrs Brogden of Henwood Cottages started to sew at nine in the morning as soon as the children had gone to school and the breakfast was cleared away. She worked till eleven and then prepared dinner and as soon as the meal was over she began again. With intervals for meals, she sewed till eleven at night. "Her daughter, Lizzie, remembers when she was eight years old, between school times, threading the needles for her mother so she would not lose time. Watching her mother, she learned by the time she was nine to "fell the seams." Thus Mrs Brogden worked day after day at linings, pockets, facings and the fourteen buttons and the seven button holes. As she finished a pair she folded it and put it on a chair. By the time Mrs Trinder called on Friday morning, all the trousers had to be pressed. There were a variety of colours - black, dark brown, drab and white and the best quality were called muskin. For the cheapest quality, a woman was paid 2½ d a pair, for the white cord 3d a pair; for the muskin 4d a pair. "Out of this she had to pay for thread and 1 shilling a week to the carrier. On arrival at the factory the trousers were examined and any bad work was returned. At the end of the week, the village woman had 2s 6d to show for all her work. "But we were happy," said Mrs Brogden to me, "as happy as they as goes to the pictures today." "She preserved her happiness through the struggle and is one of the survivors, but many of the mothers in her generation died in middle life as a result of over-work and under-nourishment." *In Abingdon in Camera, published by the Abingdon Area Archaeological & Historical Society (1979), a photograph of the interior of Clark's Clothing Factory in 1906 is annotated: "The factory was the largest employer in the area with some 2000 workers, including out-workers in the villages." Perhaps this was the factory that Esther Brogden worked for.